I believe the opportunity in cannabis is potentially even greater than the end of Prohibition. Earlier this week, I explained why that is. Medical and adult-use cannabis in the U.S. alone will disrupt markets where current spending is more than $500 billion. This could have tremendous ramifications... and present a major opportunity for investors. Now is the time to get in on this transformative trend – if you can put together the right strategy. So today, I'll share some of the hallmarks you can use to identify the most successful companies... and cover the basics of what you must know before you invest in this fast-growing space. In 2018, legal global cannabis sales were $12.2 billion. This is projected to more than double to $31 billion by 2022, a mere four years from now. Another independent source suggests the legal global market will reach $146 billion by 2025. That represents an average annual growth rate of 42%. And even if this estimate is overly optimistic and we only get halfway to the $146 billion, it is still a 30% annual growth rate. Even though premiums go up every year, copays rise, and prescription drugs keep rocketing higher... total national health expenditures as tracked and reported by the Centers for Medicare and Medicaid Services (CMS) increased around 6.5% per year between 1990-2016. That's twice the level of average inflation. And investing in the S&P 500 Health Care Index would have provided a good annual return of about 10% in that period. Now compare this 6.5%-10% annual growth for health care spending to the 30%-40%-plus annual growth in the emerging cannabis market. Most are too risky and not worth looking at right now. Many have stock prices of less than $1 a share and market caps below $500 million. As we tiptoe into this new industry, we should do it with companies that pass a few tests... They need good management, access to capital, and strategies that make sense. 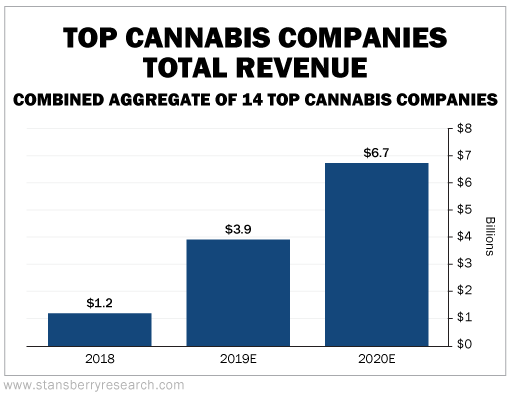 For nearly all the cannabis companies I'm watching right now, sales are rapidly rising. Tens of millions in sales are quickly growing into hundreds of millions. Focusing on sales is one way to take a much more analytical approach to the cannabis industry. Cannabis will likely be used, processed, and distributed across many different avenues. At minimum, it's likely that cannabis will be broadly available for adult use – just like alcohol and tobacco – in many parts of the U.S. and around the world. However, to do well in this space, we need to be able to separate the relatively few likely winners from the many probable losers. Valuation for cannabis stocks today is often irrational. Buying a portfolio of these stocks requires a well-founded belief that revenue growth will actually occur and that they will grow into their valuations. We are looking for companies that are "less expensive" than the broader group, but also have significant growth potential. You must also be prepared for significant volatility. This volatility will occur both on the upside and the downside. And it should affect how you handle your stock positions. As stocks rise within this emerging disruptive industry, it may make sense to take profits in some names. Conversely, as market fear pushes stocks lower, it will take guts to increase positions in the best companies. Keep all these ideas in mind as you look closer at the cannabis market and its explosive potential. They could be your ticket to triple-digit returns in this rapidly growing industry. Editor's note: If you didn't get a chance to hear from Thomas on Wednesday night, we've put together some special highlights from the big event. For a short time, you can watch selected clips... learn some of the biggest takeaways... and discover one of the best ways to navigate this disruptive industry. It's all available right here. "I am an angel investor in a start-up medical-cannabis company," Thomas writes. "And the investing implications of this emerging market are the biggest I've ever seen." Get the details on cannabis' impact on the health care sector right here. "I like the long-term prospects for the cannabis industry," Dr. David Eifrig says. "This could be the year we see the cannabis industry begin to boom in earnest." Learn more about a major development in the sector here: It's Finally Time to Get Into One of This Year's Hottest Industries. 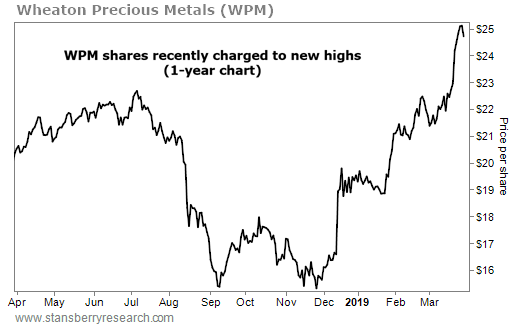 Wheaton Precious Metals (WPM) is an $11 billion royalty and streaming company. It owns stakes in about 30 gold and silver mines in 11 countries… And its partners include industry leaders Vale (VALE) and Goldcorp (GG). In its latest earnings report, Wheaton reported record-high gold production and total revenue of nearly $800 million for 2018.